I think this is enough to show how much people still love the former mobile king, Nokia. Just a few days ago, we told you that the Nokia 6 received more than 400K registrations. Well, as expected, the numbers are increasing very fast, and today, the phone completed 1.4 Million registrations. It is worth mentioning that these figures were achieved only in China as this phone is China exclusive at the moment. The first flash sale was held on 19th January where the device went out of stock in just 60 seconds so, we are sure that the same will happen in the next flash sale that is going to happen on 26th. With such an enormous numbers of registrations, Nokia has shown the world that its popularity hasn’t decreased and still, people are ready to leave their Samsung and Apple-made devices to buy the new Nokia phone. Yesterday, the company confirmed on its official Weibo blog that a Snapdragon 835 phone is in works and soon, it will be launched. It seems like Nokia will launch phones in every single price segment this year as HMD Global has already announced that 6-7 phones are coming this year. 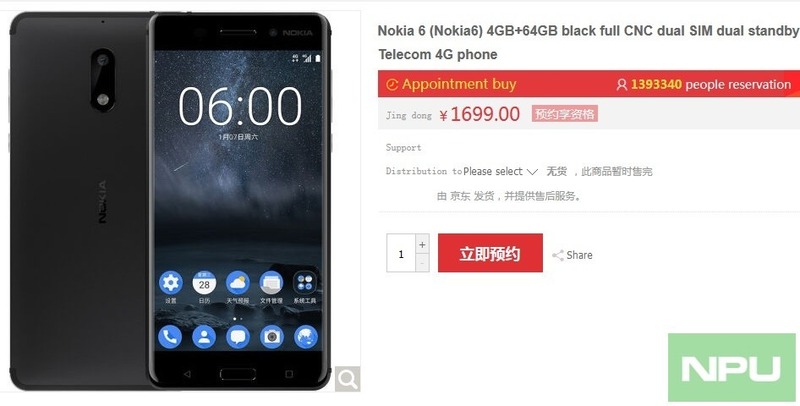 If you don’t know, a silver variant of the Nokia 6 was also leaked a couple of weeks ago which was expected to be the one for the global market. But, since Nokia has said that this is just China-exclusive, we hope to see the silver variant being launched in China in few days. Anyways, this is surely the magic of Nokia. What do you think? Do you want the Nokia 6 to come to other markets also rather than China? Do let us know via the comments section. Cheers.